Every group using Free The Change will have a different make-up and different needs. Those differences bring creative and sometimes challenging tensions to our conversations, which in turn will influence the values (or assumptions) that people will want to emphasise. You will have the chance to explore these as you get started - and it's worth doing so consciously. But below are a few that matter to us. We have found that they help groups function effectively and safely. 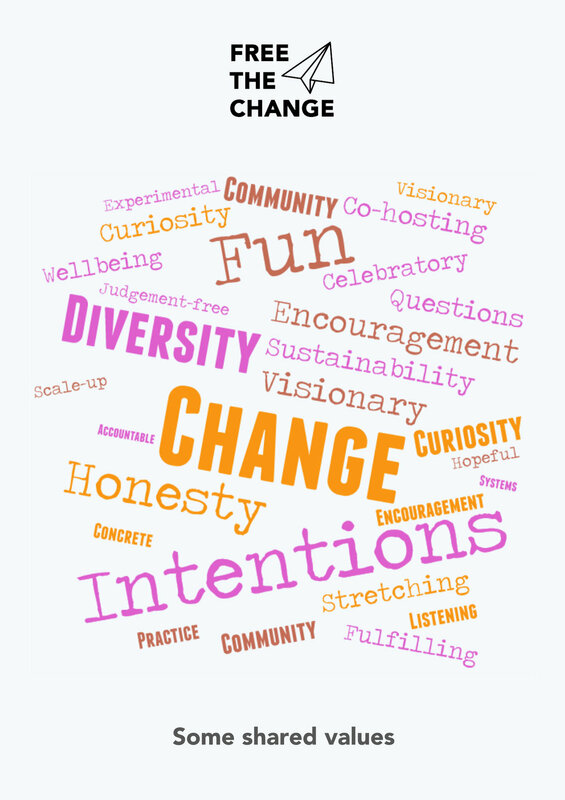 Tip: Our Taster Session suggests that groups share and discuss the values below as a starter-for-ten. They are included in the Welcome Handout. Click image to enlarge or download. 1. Be OPEN, AND SAFEGUARD PEOPLE'S STORIES. Change is as much about listening as it is about being heard. Welcome all points of view. What do they have to teach you? If you feel small or uncertain: speak up and be honest. If you feel confident speaking, notice whether being quiet for ten minutes helps others share more. Share time equally. Ask open-ended questions (that you don't have the answer to) and keep advice-giving to a minimum: unless it is requested it tends to send other people’s “inner teachers” into hiding. Let’s hope to change ourselves (along with the world “out there”). Crucially - try not to judge people who hold different views - and safeguard everyone's stories: unless someone has given you explicit permission to share something that's personal or private to them, don't. Social change means different things for different times & people. There is no “one size fits all”, and we falter not just when we over-commit, but when we pretend to be someone else. Speak from your own concrete experience. Focus on the next step you need to take. That may require bold action, honest reflection, merriment or anything in between. But it should probably stretch you healthily - which for some means action and for others taking time to stop and listen. Ask each other gently: are your next steps happening? Are they working? Is a change growing? Do you need more support? Our choices are governed by systems wherever we go. Help each other come back to the question: what’s the highest lever of change that I can have a meaningful impact on right now? Is it what we do as a family? As a company? Or as a community? Once something is working: can you help it expand? For example, if you care about green travel, you could cycle more. But then: how about asking your manager to make it easier for everyone to get on their bikes? What are the practical changes you could help create? What influences people’s attitudes and beliefs? We all bring different gifts into groups. Some see what’s clearly “practical”, others dream the future, or strive to include different points of view. But try not to let one person hold too much of any one gift for everyone else. If you’re always late, offer to time-keep. If you’re a natural carer, ask for the help you need. Keep each other hopeful: remembering that others will draw heat from changes you start, even when they don’t catch fire immediately.